The Writeous Babe Project: Style and Substance - Can Women Be Celebrated for Both? Style and Substance - Can Women Be Celebrated for Both? 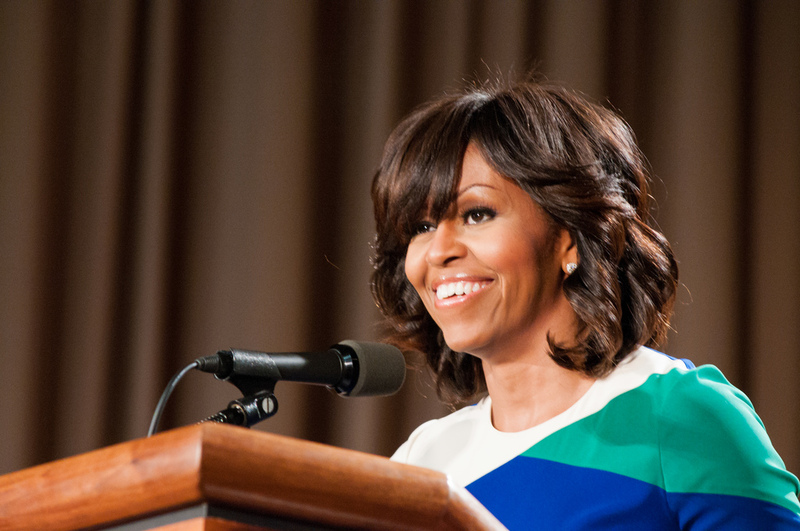 Last Friday Michelle Obama celebrated her 50th birthday. Many people -- from journalists to politicians to everyday citizens -- sent the First Lady well wishes via social media. Alabama-based writer Cassie Fambro, however, felt that many of these good intentions missed the mark. Most people seemed more focused on Mrs. Obama's sculpted triceps and trendy frocks than on the work she's done over the past several years, Fambro laments in her article "Twitter wishes Michelle Obama a happy birthday, but makes it about style over substance." Instead of linking to the efforts Michelle Obama has made to promote healthy eating and exercise with "Let's Move," mainstream media was guilty of linking to which dresses they liked best that the first lady wore. Boston.com, for example, shared 15 style lessons from the First Lady. CNN focused on "How Michelle Obama used style to move a nation." Fambro's article, made an excellent point but also made me wonder if it will ever be possible for a woman to be celebrated for both style and substance. I certainly admire the FLOTUS for both. I applaud her efforts to end childhood obesity, the successful career she had before becoming First Lady, and the moving speeches she has given while on the campaign trail for her husband. But I also love that she bucks the typical First Lady attire and rocks a style all her own. And, yes, when I'm working out in my living room to Jillian Michaels DVDs I am usually thinking about how I really want some Michelle Obama guns. But, again, is it possible for women to be generally recognized for both substance and style? I'm a girl who loves fashion. Though I don't claim to be a style maven yet, I do put thought and careful consideration into what I wear - striving to assemble outfits that are both fashionable and functional. So, yes, I walk a little taller when someone compliments what I'm wearing. But to be clear, I don't wear what I wear simply because I'm fishing for compliments. I wear what I wear simply because I want to. Wearing cute clothes is fun and makes me happy. The compliments are just an added perk. And I love Mrs. Obama's style because she seems to be the kind of lady who wears what she wants, also. And while compliments on my clothes are great, I want even more accolades for my writing and my teaching. My point is I want to be sharp in every sense of the word -- a sharply dressed lady with a sharp mind. But women who take pride in their appearance are often considered self-centered or vain or less intelligent. Even some of my fellow feminists claim that women who bother to paint their nails or pick out pretty pencil skirts are wasting precious time that should be used on writing, organizing and smashing the patriarchy. So often women are told that we must avoid trendy attire, clothes that accentuate our femininity and colors like pink in order to be taken seriously. The first time I taught a writing class in graduate school, I was worried. I wasn't worried about the material I would teach because I was well prepared and I was going to teach what I enjoyed teaching. Instead I was worried about what to wear. I wanted to be taken seriously. I knew that because I was female I would automatically have to prove my worth and I was worried that if I looked too feminine I would not be taken seriously. I really wanted to wear my shiny lip gloss and my girly skirt, but I decided not to. Instead I wore a very serious, very manly, and very ugly suit because the sad truth is when it comes to appearance we start off with men as the standard, as the norm. Adichie goes on to point out the fact that when a man is getting ready for a business meeting he never has to worry about looking "too masculine." If Adichie could go back in time, she'd wear her shiny lip gloss and girly skirt. I wish I had not worn that ugly suit that day. Had I then had the confidence I have now to be myself my students would have benefited even more from my teaching because I would have been more comfortable and more fully and more truly myself. I have chosen to no longer be apologetic for my femaleness and for my femininity. I want to be respected in all of my femaleness because I deserve to be. And so I want my writing and my wardrobe to look good. I don't think I should have to choose between one or the other. I think it generally depends on context. If someone is writing about my work, I'd like them to concentrate on my accomplishments--I get severely bugged when I read a profile about a successful woman that has to mention that she has stylish hair or is wearing stilettos to the interview. But when it comes to me as a person, my work is only part of my life, and yes, my cute hair and my purple nail polish and my fun shoes become relevant. Those things are choices I make that reflect who I am. I completely agree that if someone is writing about my work I want them to focus on my work. What annoys me is that many people imply that if a woman cares about fashion or makeup that's all she cares about or that she's anti-feminist. I totally agree. I have room in my brain to care about equality and social justice and also put on eyeliner. I can even think about those WHILE I put on eyeliner. Issues of women with makeup and fashion and feminine performance are so, so complicated and involved; judging a woman's feminism based on just that is reductive and silly. I hear you on this. I've become more fashion- and beauty-conscious in recent years - like, very recently, like LAST YEAR - and it's something I do mainly because I get a lot of enjoyment out of it. Like, I find it fun to wear eye shadow and paint my nails. I didn't understand it for a long time, but now I do. My evolution in this regard has been complicated and multi-faceted, and I'm still trying to figure it out, but one thing I've come to understand is that I really took the idea that a feminist doesn't do hair/makeup/fashion thing to heart when I was a teenager, and then it was reinforced over and over again through a variety of channels (both from feminists and from mainstream society). Once I hit my 30s and started to feel secure in myself as a human being, the need to really assert myself as a Capital-F Feminist faded and I stopped doing the knee-jerk rejection of all things coded feminine. I still totally advocate for the right of women to opt out of these things (and for men to embrace them!) but I'm more flexible about it, too. I too believe women should be free to opt out of these things and not be judged for it. I just get upset when women who choose to embrace them are considered bad feminists or aren't taken seriously. Great article Javacia. As someone who is fashion centric and style focused I also do not want my substance to be discredited or overlooked. Both are important to me. Thanks for reading, Jeniese. And I know you well enough to know that you are definitely a woman of both style and substance.